Halloween is just around the corner, but when it comes to decorating your home for the spooky holiday, it can be a challenge to keep things eco-friendly. Most store-bought decorations are made with non-recyclable plastic and covered in toxic paint or synthetic fabrics. But there is no need for frivolous spending and waste when it comes to decorating for Halloween. There are some great DIY ideas that you can use to upcycle things that are already lying around your house, allowing you to keep your environmental impact to a minimum. Upcycle your egg cartons by using them as bat decorations. With some non-toxic black paint, ribbons, glue and googly eyes, you can make these cute egg carton bats from Crafts By Courtney. This idea is extremely easy, and all it takes is some old white bed sheets, leaves or newspaper and some string. Simply stuff your old sheets with leaves or newspaper and tie some string around the sheet to make the head. Then, hang them from trees to add a spooky effect to your front yard. Dairy containers can come in handy when it comes to making sustainable Halloween decor. Save your old milk jugs and turn them into skeletons with string, scissors, a craft knife, glue and a hole punch. This idea from the Recycle Guys is a fun project to do with your kids, and it won’t cost you any more than the price of the milk you already drink. This simple Halloween decorating idea comes from Instructables, and all you need is yarn and scissors. Start by laying out a basic horizontal and vertical frame from the yarn, and then start weaving more yarn to make a web. You can find the step-by-step instructions here. If you put spider webs on your front porch, then it makes sense to add some giant spiders. According to Money Crashers, you will need some large black trash bags, leaves or newspaper, zip ties and a glue gun to make this creepy crawly. With some mason jars — or old baby food, pickle, olive or sauce jars — you can turn your home into a mad scientist’s laboratory. 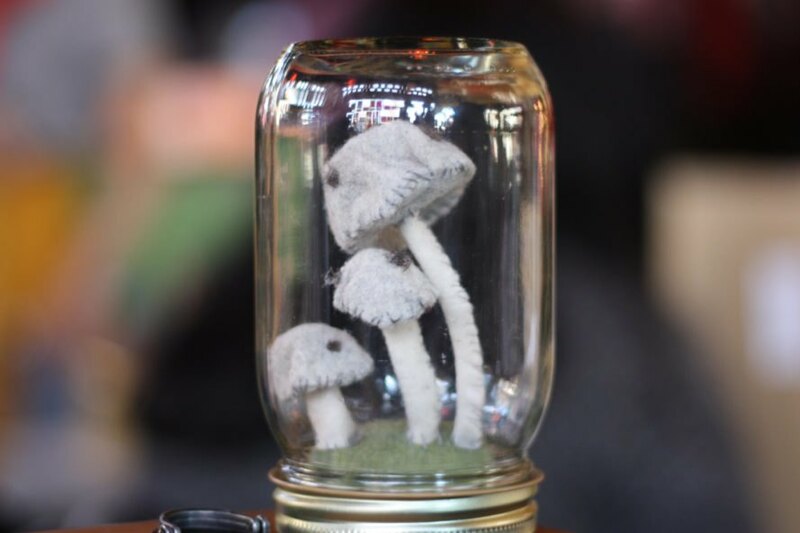 Put animal toys, eyeballs or other strange objects into each jar with some water and non-toxic or natural food coloring, and fill a shelf (or a window) with some crazy Halloween experiments. Who doesn’t have some old bed sheets lying around that don’t fit any bed in the house? I know I do, and white ones make the perfect Halloween craft item. Cut the fabric of an old sheet into thin strips, and cover a cereal or cracker box with the sheet pieces to make it look like a mummy. Then, add some googly eyes to make the perfect mummified decoration. With some used cardboard boxes, non-toxic paint, scissors and wood stakes, you can turn your front yard into a cemetery for Halloween. Make tombstones to place all over your yard, and if you add some artificial moss from a craft store, it will make it look even more authentic. 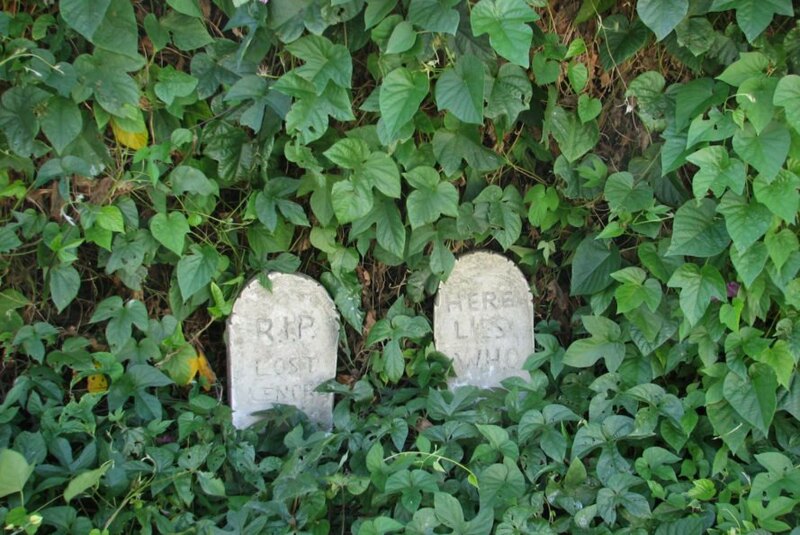 For something you can use year after year, create your own tombstones from concrete. Yet another idea for used milk jugs, you can make ghost lights with black construction paper, string LED lights, some googly eyes and a little glue. 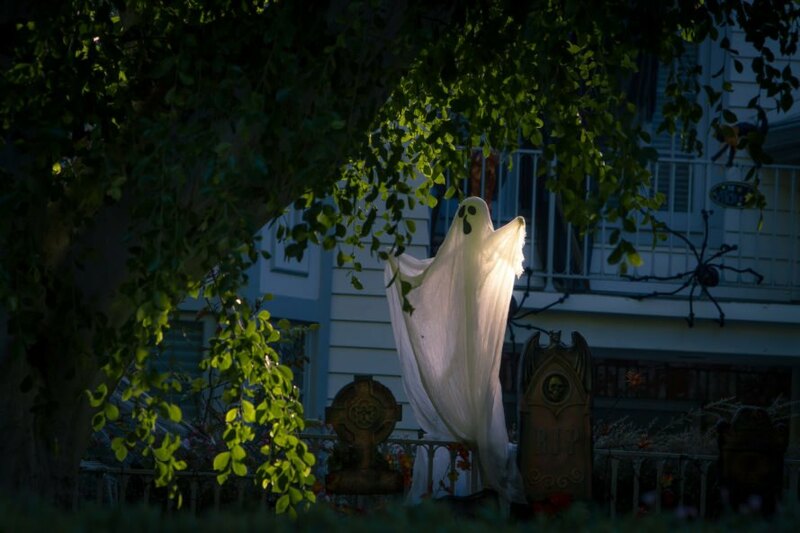 You can light up your walkway or front porch with these little ghosts. This is an obvious eco-friendly choice, but you don’t have to limit yourself to carving pumpkins for Halloween. Instead, you can wrap gourds in bows or paint them with non-toxic paint to create environmentally friendly decorations. 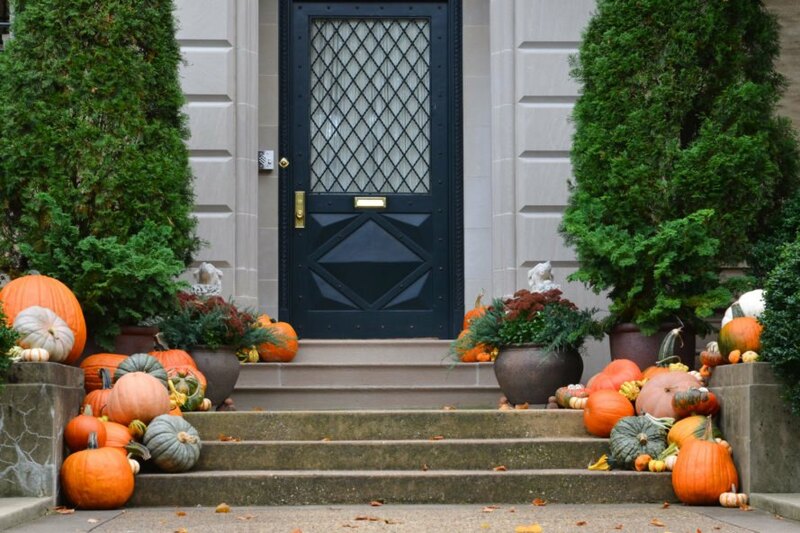 If you want to keep things really simple, use plain gourds and pumpkins to decorate your dinner table, add some color to your front porch or line your steps or walkway. Then, compost your pumpkins and gourds after Halloween to help fertilize your garden. It is possible to go green at Halloween, you just have to look around the house for items that you can reuse to help reduce the problem of holiday waste. The options are endless when it comes to DIY eco-friendly Halloween decorations. When you opt to make a few instead of buying plastic items at the store, the environment will thank you. Using some recycled items and your DIY and upcycling skills, you can make eco-friendly Halloween decorations for your home. A simple white bed sheet can become a spooky ghost. 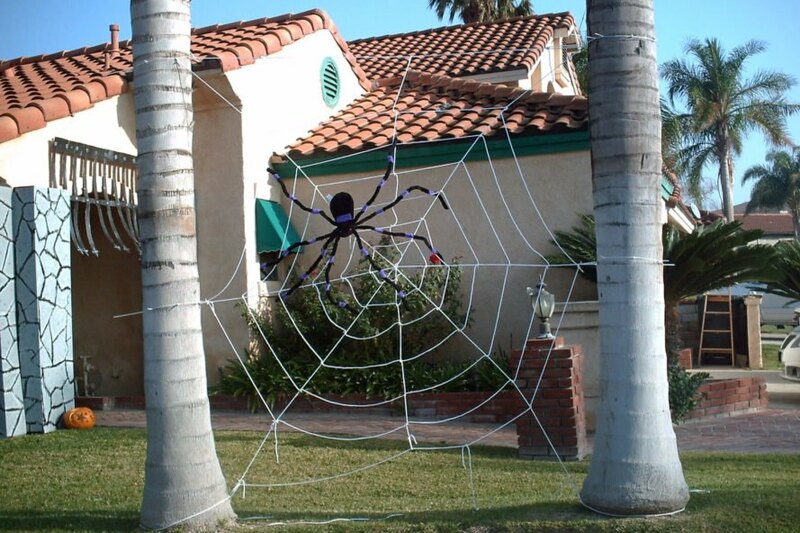 Use yarn to create massive spider webs. Fill glass jars with oddities to make fake lab specimens. Turn cardboard or concrete into tombstones for your very own creepy graveyard. Use this season's bounty of gourds as simple decor that can be composted later. How will you decorate sustainably this Halloween?